When you live in a cold-weather climate like we do here in northern Utah, it’s a welcome reprieve to spend a few days away enjoying someplace sunny and warm. A couple of days ago, as I was uploading photos of sunshine and blue skies from a recent trip, it occurred to me that it had been a Very Long Time (so long that I’m not going to admit how long) since I had backed up the photographs on my home PC. Nope, not very smart, I know. If I were to go home this evening and find that my laptop wouldn’t boot, I would be one sad puppy. So what’s stopping me from doing a backup? Inconvenience (and laziness). It’s a time-consuming task, and external hard drive manufacturers don’t seem to make that task easy to accomplish. Your data and user-created files are just as important as my family photos. (OK, I’ll admit they’re more important.) 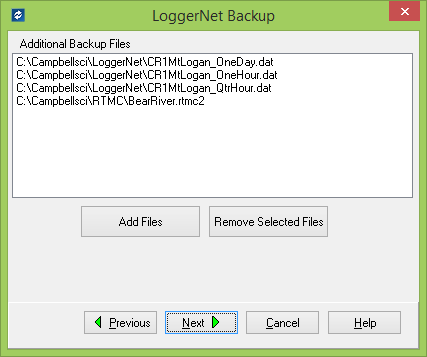 But hopefully, we’ve made the task easy for you when you use LoggerNet’s Backup Utility. You can find the Backup Utility in LoggerNet’s Setup Screen. The Setup Screen has two modes—EZ View and Standard View. To access all the functionality of the Backup Utility, we’re going to put LoggerNet into Standard View. The Backup Utility is found in the Setup Screen's Backup menu. The Backup Utility first and foremost creates a backup file (*.bkp) of your entire LoggerNet network map. The network map includes the communication link details, location and format for storing data files, and the data collection pointers for each data logger. These data collection pointers tell LoggerNet what record it collected last from each station, so it can pick up where it left off the next time it collects data. Along with the network map, you can use the utility to back up other user files: *.dat data files, CRBasic program files, RTMC projects, etc. You can even back up LoggerNet’s data cache if you choose. (The data cache is a subject for another day.) Files are easy to add as you step through the Backup Utility wizard. If you want to perform backups manually, the Manual Backup option will work. If you save the Manual Backup configuration, you can manually run the task at any time. However, it’s just as simple to set up a Scheduled Backup, so the task of backing up your network and files is performed on a routine basis. For instance, you might want to set up a backup task that occurs every Friday at 5:01 PM. It's a smart idea to save any backup file to someplace other than your own computer. (A network drive is a good place.) That way, if your computer fails, you haven’t lost your network map and other important information. All you need to do is use the Restore Network option to recover your network map and other files that were saved in the backup. In addition to helping ensure that you don’t lose important data, backup files are useful for technical support. If you call Campbell Scientific for help, you might be asked for a copy of your network map. The staff person assisting you can load the network into his/her copy of LoggerNet and see exactly how you have configured the stations in your network map. This helps the staff person to understand your setup, so he or she can answer your questions more efficiently. I hope this information has been useful. 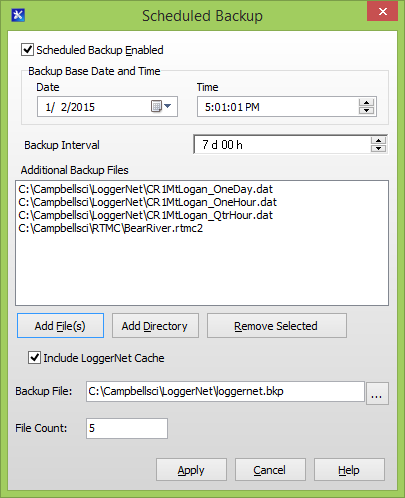 While it's fresh on your mind, why not create an automatic backup in LoggerNet right now? 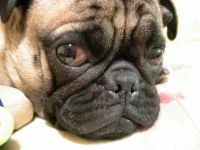 If you're already using LoggerNet's backup feature and have a story to share about how it saved you from being a sad puppy, let us know. Now...I'm off to back up some vacation photos!